Carole Mortimer has written over 200 books in the contemporary and Regency genres. Carole is Recipient of the 2015 Romance Writers of America Lifetime Achievement Award, a USA Today Bestselling Author, Entertainment Weekly Top 10 Romance Author, 2014 Romantic Times Pioneer or Romance, and in 2012 was recognized by Queen Elizabeth II for her ‘outstanding service to literature’. She is very happily married to Peter, they have 6 sons, and live on the beautiful Isle of Man. Rogue Alpha, the 7th story in my #1 Bestselling ALPHA Series, is published today, and to celebrate I am giving away FREE, Christmas Alpha, the introductory novella to the series. Christmas Alpha is now also a year old, so that’s two reasons to celebrate! 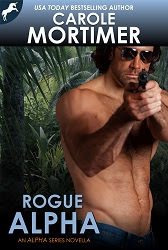 Rogue Alpha (Alpha 7) is a fast-moving story, beginning in the jungles of Colombia, to the dark streets of London, and then the shadows of Paris. Diana is convinced someone broke into her Paris apartment. Just as she believes someone is now following her. The police don’t believe her, and the only person she can turn to for help is Seth Armstrong. Seth works for Grayson Security, and was the man who rescued her eight months ago, after she was kidnapped off the streets of Colombia, and a ransom demanded for her safe return. Christmas Alpha (Alpha 1) is now FREE on ALL ebook sites.